"These are simple statements. In them an artist explains, in words of foreign languages he loves, that he has no intention of teaching or exhorting; he wishes to depict not just a carefully chosen part of himself but all of himself. Here is no moralist, no pedagogue, no guardian of souls, no zealot with a one-track mind. Here we are in the presence of a good companion—a kind, sincere, naive fellow who lives life to the full and, if he criticizes it for its distortions, does so not out of bitter disillusionment but with natural, unaffected feeling. Does that not inspire unusual confidence as a beginning?. . . The Sun is basically one large pictorial novel depicting a man’s search for peace, happiness and the sun. This quest takes place in a smoke stacked industrial city, juxtaposing the inner and outer quest of the protagonist with the harsh realities of the outside world. . . 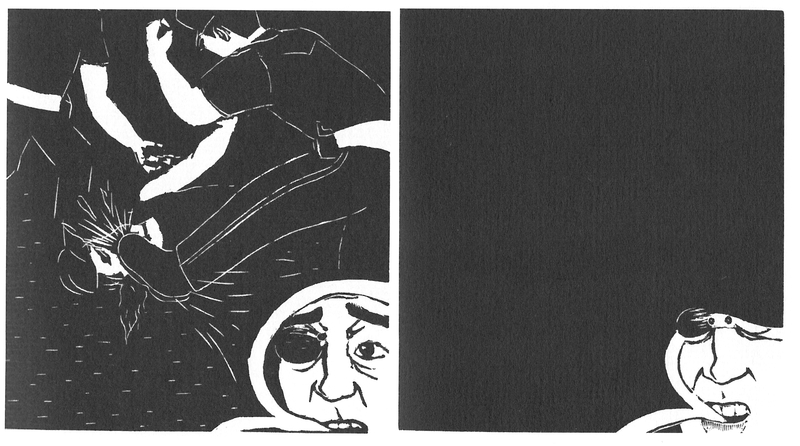 The images in " Story Without Words." are strung along the line of a clever conceit: a man tries to woo a woman he’s smitten with, and all his sweet words, bragging, and imploring are shown by shifting the background behind their figures. When he says he’ll show her around the town, a restaurant table appears, bedecked with fine food. When he brags about his strength, a circus-ring with a weightlifter appears. A few juxtapositions clap together polar opposites that become two sides of the same coin: in one panel, the man doffs a top hat, a flower jutting from the lapel of his tuxedo, feeling like a millionaire; in the next panel he is shown in rags, a poor beggar. In one panel he is kneeling in prayer before the woman, in front of a church; in the next panel he is crawling after her, while in the street a dog tries to sniff the hind end of its prospective mate. Altogether, it plays like a pure visual distillation of every love song ever sung. "This is the city and I am one of the citizens. Whatever interest the rest interests me. . ."
Housed in a modern custom plain board slipcase. One of ca. 50 copies, with linocuts (in brown or orange) printed by hand by Giacomo Patri. Signed vertically in ink by Patri along the gutter of one of the preliminary pages. 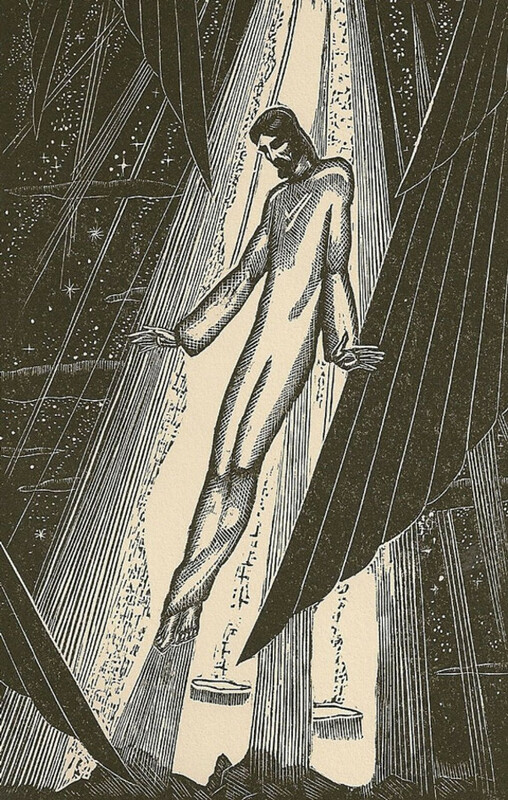 Introduction by Rockwell Kent. A classic from the Great Depression much in the style of early Ward or Masereel. First published privately just prior to World War II, White Collar has remained a biting critique of the powers that be, and at the same time championing the working class. "White Collar was to be my contribution to, what I believed then, an indispensable understanding of the necessity of unity among all American workers and voters. I was not a writer, so illustrations in sequence were I thought the answer. I had a printing press and lots of linoleum to use for linoleum cuts, so I set to work the idea of doing the entire job myself. I was young, naive and in a hurry, but I soon discovered that a book, a story, an ideal, each is a slow process, even with some help from the family. 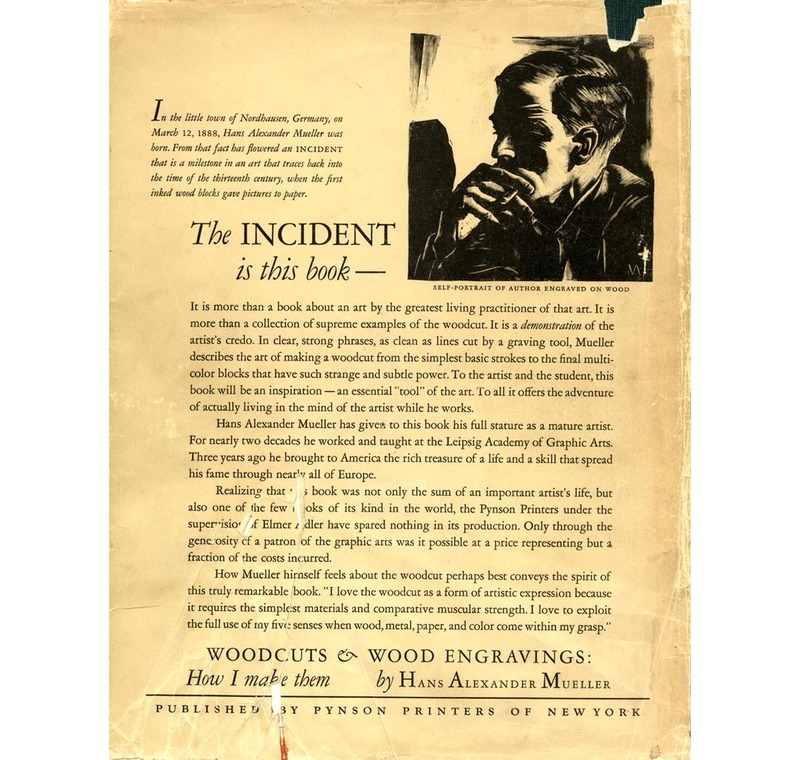 It took several years to engrave, print, bind and distribute a boom that was seen by a very few people who did not need convincing." - Giacomo Patr June, 1975. Neil Bousfield: My practice as an artist is expressed within the medium of relief printing and now almost exclusively within the technique of engraving. My work falls into two main areas: the creation of single images. . . and handmade books which are long term projects taking months or even years to produce. 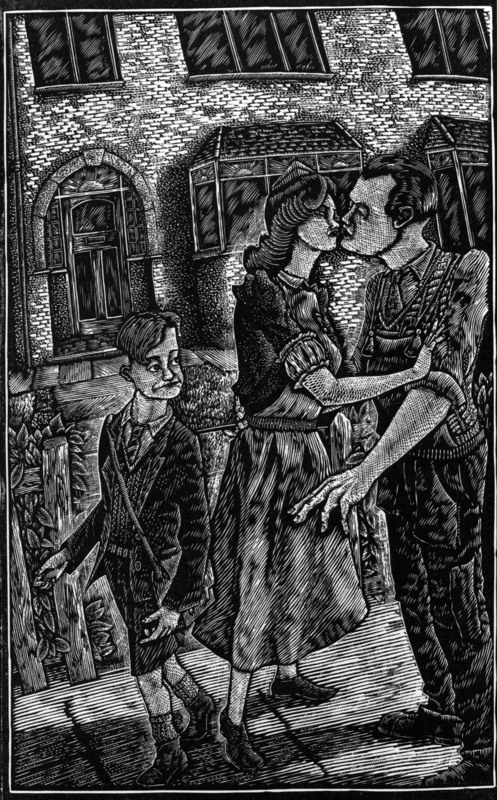 . . My work is driven by a concern with social narrative and has led me to work within the genre of "silent pictorial narrative" as defined by Lynd Ward and pioneered by Frans Masereel. . .
"Walking Shadows" (aka "The Cycle") is an impressive volume of work. 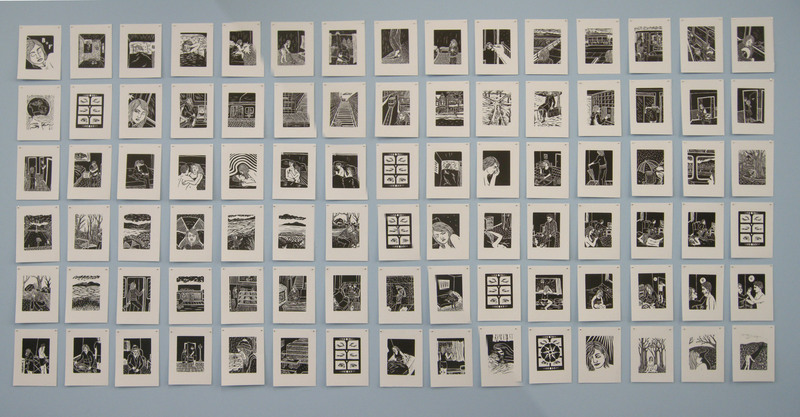 Following in the footsteps of Frans Masereel and Lynd Ward, Bousfield has created a novel in which each of its pages are an original relief print—over 200 different page sized images. This "novel without words" is the story of a working class British family and the cycles of anger, depression, and violence produced by lifetimes of meaningless labor and lack of opportunity for self-fulfillment. Interesting things are at play here, with Bousfield's attempt to bring the novel without words into the 21st century. There is something jarring, yet interesting, about the representation of cctv and video game consoles in wood block. Conveying contemporary issues in 100 year old aesthetics feels a bit strange, but I suppose the same could be said about most of us here at Justseeds making political graphics for today's struggles in anachronistic hand-printing techniques. At a certain point the story of the working class bothers becomes difficult for me to parse, and I have a hard time distinguishing between the characters, illustrating the difficulties of telling a detailed narrative in pictures alone. 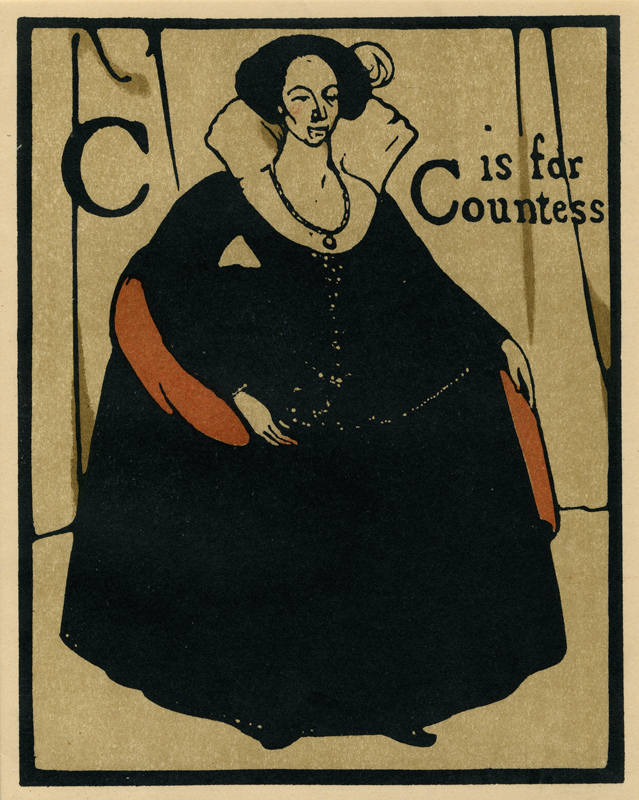 Never mind rough block prints, which limit the amount of detail the artist can convey. I find this a bit distracting from the book, but it is minor in relationship to Bousfield's achievement. Much of Bousfield's imagery has an awkward charm, and stylistically owes as much to more contemporary sources such as RAW and World War 3 Illustrated as it does to the original masters of the wordless novels, Masereel and Ward. Unlike a more devoted follower to this source material such as Erik Drooker, Bousfield's effort is visible in his work, and not not nearly as clean or perfected. This makes it feel more original, and interesting. 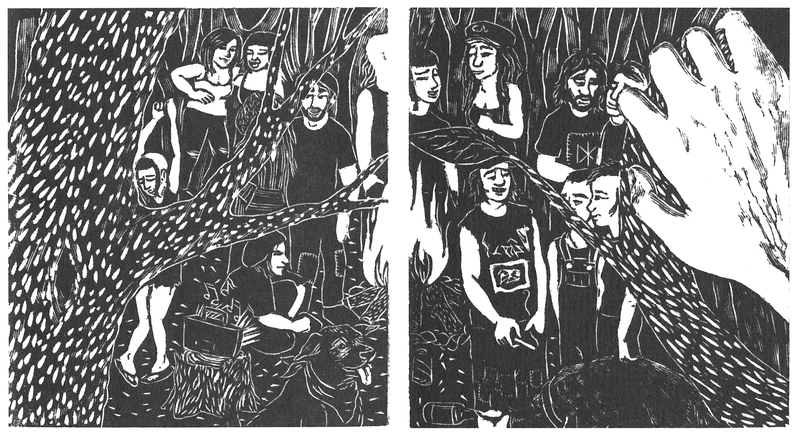 "A story in wood engravings set in the depths of Ontario's rebellious youth counterculture." "A willful young woman revels in the surprisingly-inclusive communal aspects of life in the punk / anarchist counterculture as it was practiced in the hardscrabble underbelly of Sault Ste Marie on the cusp of the 21st century." 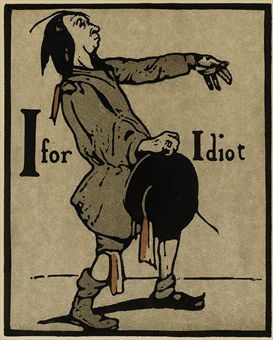 Gross was a popular American cartoonist. 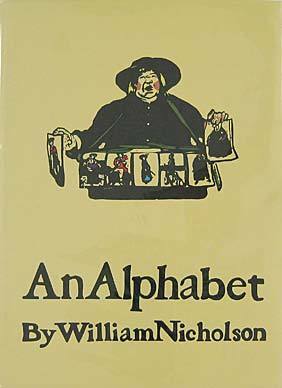 In 1930 he published a graphic novel without words. For its plot and its huge doses of humor, he was influenced by the silent films of Keaton and Chaplin. The story is simple: an honest and robust trapper is cunningly deceived by a miserable villain, who manages to trick his girl. From here, it unleashes the unbridled pursuit, full of hilarious gags, and told with a remarkable compositional freedom. Sergio Garcia says in his magnificent study the graphic novel: He Done Her Wrong On took the typical elements of any Hollywood melodrama and The Odyssey that became a modern world that functioned as a distorting mirror of Lynd Ward's pathetic noble visions - explicitly parodying God's Man at times.  Ca Ira: Blog de la Foundation Ca ira! The Equinox Cooperative Press, which published 12 books and 4 soft-covered Equinox Quarters from 1932-1937, was the idea of Lynd Ward and Henry Hart. 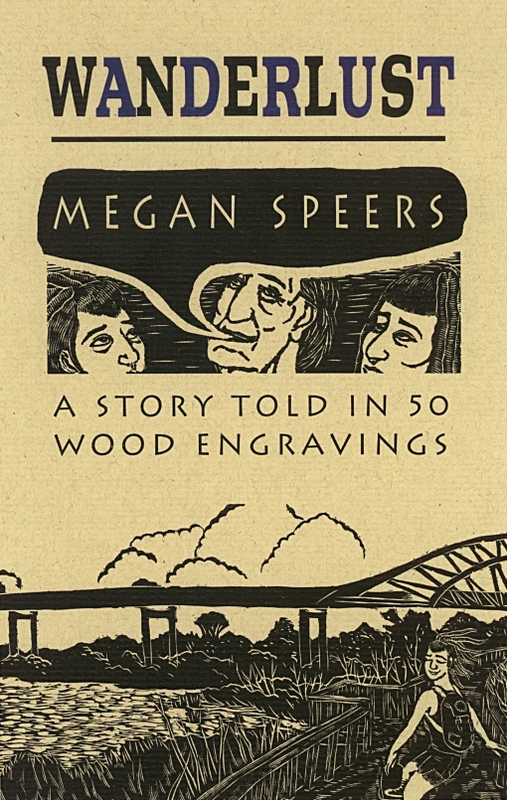 In her autobiographical memoir addressed to Fay Gold on October 18, 1955, Heller West Heller complained about many things - including about publishing her book of woodblock verse (Migratory Urge), a process she claimed Lynd Ward later took credit for. 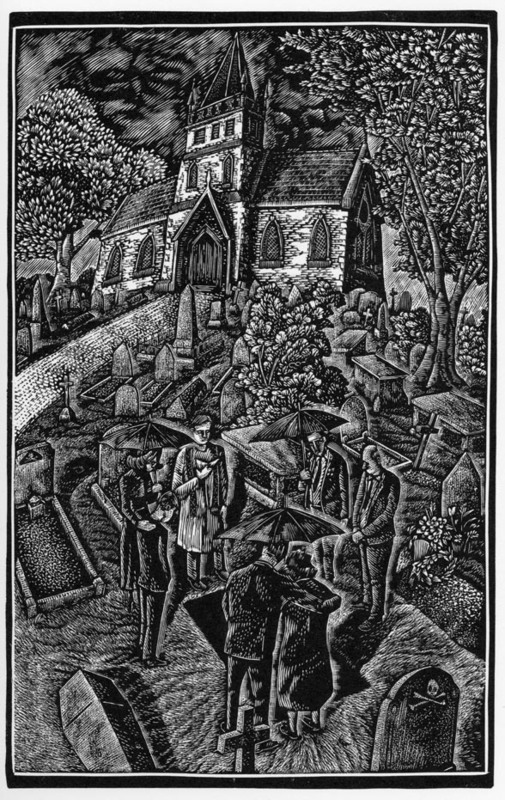 Regardless of Heller's bitter feelings, she and Ward shared many common interests in terms of printmaking and social concerns - Lynd Ward would be the main speaker at her memorial service on April 13, 1956.
whose view of the the world is much like mine. 1 June, 1985, Henry Hart"
Pasadena: Esto Publishing Company, 1934. 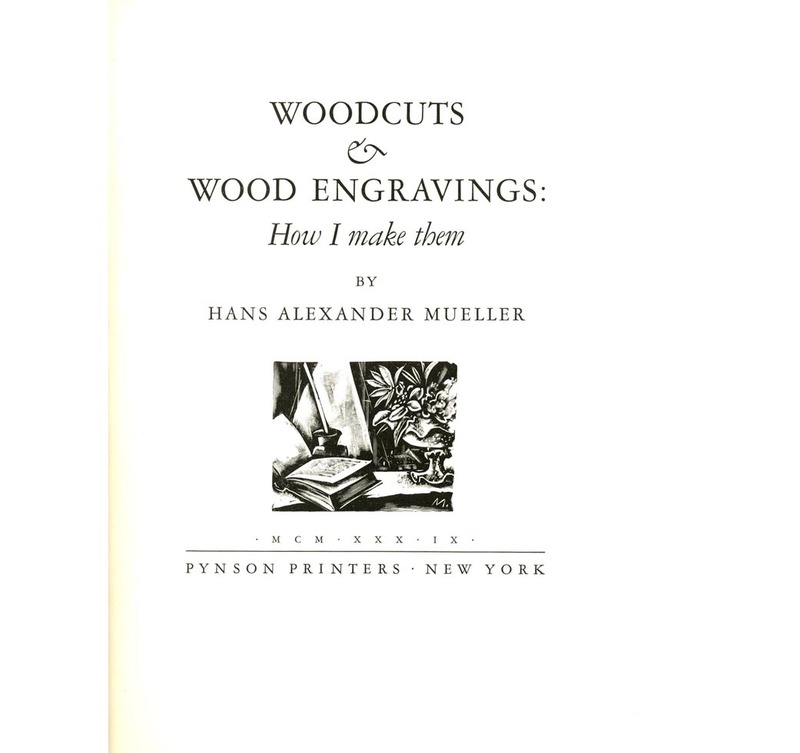 First edition, 1 of 1000 copies. Small 8vo.  May Day? Labour Day? Loyalty Day? Frans Masereel was 75 years old when he published Route des hommes (1964). He did “novels without words” all his life (more than 50, according to David Berona). Route des hommes is about the horrible and great things that happen to humankind. 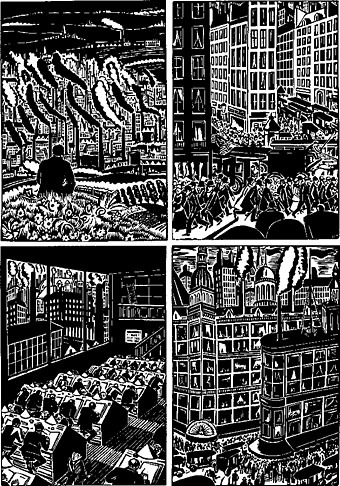 We find in the book Masereel's usual topics: war, famine, exploitation, but also progress, team work, joy, etc. . .
with original woodcut "Prayer Tree"
"The challenge remains. On the other side are formidable forces: money, political power, the major media. On our side are the people of the world and a power greater than money or weapons: the truth. ROSEHILL CEMETERY  HWH TIMELINE  SELECTED PRINT DEALERS  WORDPRESS.COM  CANTON, IL  TEN TRIPS. . .